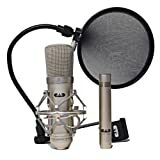 The GXL2200 is great for recording studio vocals, voice-overs, choirs, acoustic instrument, strings, piano, cymbals, or as an overhead microphone. The GXL1200 is best used for recording choirs, orchestras, acoustic instruments, guitar cabinets, strings, piano, cymbals, hi-hat and, also as an overhead microphone. Together, they make a great pair for all of your recording requirements. The GXL2200 is a large diameter, fixed cardioid pattern, condenser microphone. High sensitivity and low distortion make this microphone an ideal candidate for recording, broadcast, sound reinforcement including vocal and instrument applications. The capsule in the GXL2200 features a 1 inch gold vapor deposited diaphragm. The GXL2200 requires standard 48-volt phantom power and comes with a swivel mount that will fit any standard 5/8 inch x 27 threaded microphone stand. The swivel mount can be removed by unscrewing the knurled ring on the bottom of the microphone. The GXL2200 microphones are audio tested and inspected under the direction of CAD Professional Microphones, offering an exceptional level of value.